Global financial markets are more complex and more highly regulated than ever before. The Investment and Financial Risk Management programme equips you with the skills to move into this competitive jobs market with confidence, from portfolio management to risk analysis. 1:18 • YOUTUBE VIDEO Daniela tells us how yoga has helped her to be more patient. She believes that perseverance and focus will help her to achieve her long-term entrepreneurial career goals. Our finance courses are for students who want to progress with the knowledge and skills required for a successful career in the increasingly competitive world of global finance and banking. The BSc Investment and Financial Risk Management is for students who want to work in a wide variety of finance and investment fields. Maybe portfolio management or investment analysis. Maybe corporate treasury or financial trading. You want to understand the role risk plays in investment decision-making and how to manage it. Our three degrees in finance (Finance, Banking and International Finance, and Investment and Financial Risk Management) provide detailed knowledge of how financial markets work, how companies make investment, financing and acquisition decisions and how modern banks operate. If your goal is a career in the international investment and risk management world, consider this course your jumping off point. You’ll gain an in-depth knowledge of how modern investment analysts and risk managers operate. As you move through the degree you’ll prepare for your career in investment management, trading or analysis in any area of finance. You’ll study every aspect of the discipline, from managing global investment portfolios to asset trading. All within a broad sweep of rigorous academic learning encompassing equity markets, bond trading, risk management, derivatives, hedging, investment banking and many other broad areas of risk and investments. As a result, you will gain a good understanding of financial markets, its activities and its products. The jobs in this field are both exciting and well paid. They demand intellectual rigour and commercial acumen, and by selecting this course, you too can prepare yourself with the skills and competencies these jobs require. Learn how to apply academic and vocational skills to investment and risk management problems. Comprehend the role and functions of modern financial intermediaries and investment markets. Understand the practice of applied investment and risk analysis. Fully grasp the risk management process and the associated tools. Appreciate the importance of hedging and the role of derivatives/spot trading. The first year is common across all three of our finance courses, with students from the various disciplines studying together. This provides our students with strong foundation to financial markets, banking, economics and quantitative methods. You will also gain an understanding of the tools used in applied investment analysis and enhance your mathematical, statistical and computing skills. This module looks at key functions of banking firm. The emphasis is on what differentiates banks from other financial institutions, as well as the information problems inherent in the banking industry. Participants will understand why financial intermediaries exist and their role/impact on the global economy. This module covers communication skills, cognitive skills, IT skills, and social skills. The module aims to provide with an underpinning and understanding of a portfolio of key skills required in the business world to assist participants in their academic study and prepare them for their ensuing professional career. This module is an introductory course providing participants with a basic understanding of the financial analysis role in decision-making. More specifically, this module provides a basic level of the core principles of corporate finance, financial markets and investments. This module looks at the macro aspects of economics such as market growth/cycles, measurement of aggregate activity, basic demand side models of GDP determination, aggregate demand/supply, money in the economy, the transmission mechanism of monetary policy, fiscal policy and the public sector, balance of payments, FOREX and international trade. This module provides an introduction to the basic mathematical techniques used in finance to aid decision making, with illustrations to the relevant problems in finance. It gives you the mathematical foundations that are necessary in your second year Finance and Financial Econometrics courses. This module looks at the micro aspects of economics such as resource allocation, demand-supply and price, consumer demand, production and costs, oligopoly versus monopoly, as well as the roots of market failure/success. This module provides an underpinning and understanding of the basic statistical techniques used in finance to aid decision making. It delivers the statistical foundations necessary for the more advanced finance modules. The first half of your second year continues to be consistent across all three finance courses. As the year progresses you will develop the theoretical knowledge that enables you to interpret financial data through the use of advanced statistical tools and formulate and solve complex problems in finance. You will gain a thorough understanding of the framework for the measurement of risk and return. The course also introduces econometrics and its application to modelling and testing in finance. Hence, you will gain a good understanding of the relationship between financial theory and empirical testing, and application of this knowledge to the appraisal of the empirical evidence in corporate finance and capital markets. Elective modules enable you to deepen your knowledge of subjects such as investment, finance and risk, insurance and real estate. The second half of your second year gives you the opportunity to begin to specialise with an array of elective modules. This module presents core corporate finance material, including topics such as company valuation and investment appraisal and examining questions including how should a firm set its dividend policy, from which sources should a company raise capital and how should companies decide on their acquisition strategy. In the final year, the core modules will enable you to gain in-depth knowledge of investment and financial risk management. You will also select five or six electives which will allow you to extend your knowledge of finance and the applications of mathematical models, enhance your understanding of the role of financial markets or focus on areas such as investment or accounting. As a result, you will be able to demonstrate a good knowledge of the major theoretical tools and theories of finance, and their relevance and application to theoretical and practical problems, their assumptions and weaknesses, and ability to propose alternatives. As one of the electives, you may also undertake a dissertation in a financial subject relevant to your interests and career aspirations. The aim of this course is to develop an understanding of fixed income securities and their use in portfolio management. The focus is on valuation, return and volatility of fixed income securities and their portfolios, the role of fixed income securities in risk management and bond portfolio management strategies. This course aims to provide a thorough understanding of the blend of strategic and financial concepts applied to M&A, but more importantly a recognition of the impact of corporate restructurings on organisations and people. At the end of the course, students will be able to form their own views about M&A and be prepared to make their own creatively strategic and analytically supportable recommendations regarding potential M&A transactions. Our teaching style is based on encouraging you to think independently, to form your own opinions and critique relevant theory. We underpin your learning with the pertinent theories in your field embed with real life practices so you understand the way modern markets and businesses operate. Our courses offer numerous practical applications (or have a strong vocational element) without compromising their academic rigour. We use case studies, thought provoking scenarios and group work to give you a head start in the real world. Each module will be a mix of lectures, seminars and group work. Most modules are assessed by a combination of exams and coursework. The first year of your programme contributes 10% to your final degree classification, the second year 30% and the final year 60%. 12% scheduled learning, 88% independent learning. Please be aware that the options available to you from the full list of partner institutions will depend on the study abroad programme you select. For more detailed information on this, please contact the Student Exchange Team. A key part of a Cass degree is the opportunity to gain professional work experience. BSc Investment and Financial Risk Management students are eligible to undertake a one-year paid work placement during the third year of a four-year sandwich degree programme. 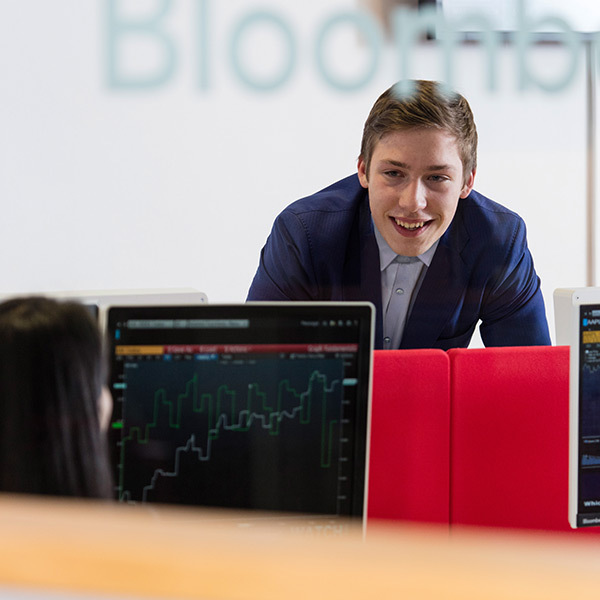 BSc Investment and Financial Risk Management students enjoy a wide range of professional placement opportunities in business areas such as corporate finance, operations, sales and trading, prime brokerage and hedge funds. Although this additional year is not credited and will not count towards your degree classification, it is a recognised part of the degree programme and will be endorsed on your final degree certificate. ** In 2019/20 the fee was £18,000 for the first year of study. The institution reserves the right to increase your tuition fees annually to take account of the institution's increased costs of delivering educational services. The increase will normally be 2% but this is kept under review with reference to the RPI. If the institution intends to increase your tuition fees you will be advised of this alongside the published entry fee. The majority of graduates from the Investment and Financial Risk Management course enter challenging and rewarding careers in the investment and risk management field as well as in the fund management industry. Graduates keen to transfer their specialist quantitative modelling techniques take up front-office roles such as trading, bonds and stocks, while others are employed in market risk management and fund management or with regulators such as the Bank of England and the Financial Conduct Authority. Study with academics and students from all over the world. CII Insurance students: 530 Business and Economics (worth 30 credits at Advanced Diploma level), 25 non-unit specific credits at Diploma level; P67 Fundamentals in risk management (25 credits at Diploma level) based on FR2105 Corporate Risk Management.